In high school, Peter Propp’s rock band played covers of the Clash, Talking Heads and Pink Floyd all around Albany. Later, in New York in the 1980s, he had a (quick) gig at CBGB. He went corporate, then got into tech. But he never left music behind. Growing up in Westport, Orphenian and 1981 Staples High School graduate Suzanne Sherman liked James Taylor and Joni Mitchell. She earned an MBA at Columbia, worked in the recording industry, and is now a longtime and much-loved music teacher at Greens Farms Elementary School. Peter and Suzanne got married. They share a love of all kinds of music. 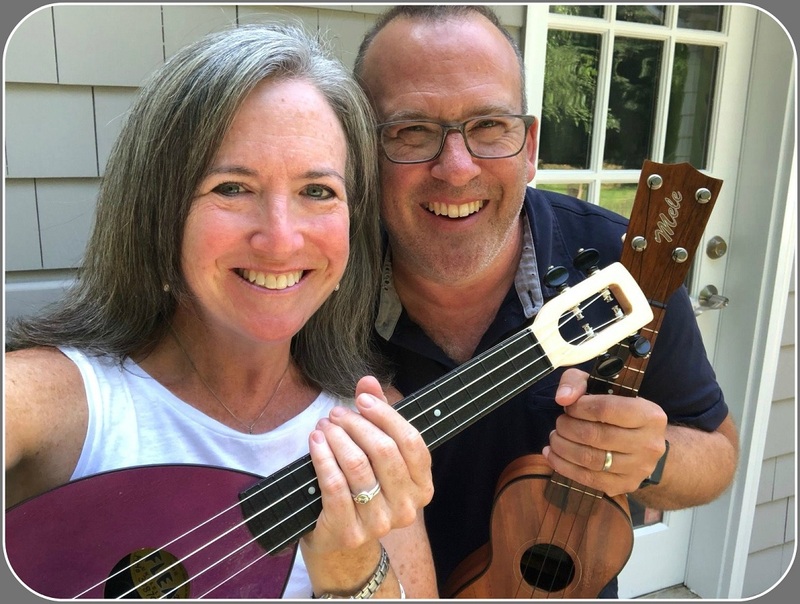 Suzanne Sherman Propp and Peter Propp, ukes in hand. They started playing last year, in a Westport YMCA group led by Steve Forlano. When they heard about Connecticut’s Got Talent competition in Norwalk, they submitted a video. Excited by the competition, Steve and Peter decided to produce a Ukulele Festival. They found a perfect, intimate venue: Westport’s Suzuki Music School, on the lower level of Colonial Green. The event is set for Saturday, September 29. Workshops run from noon to 5 p.m. Concert doors open at 6. Peter has plenty of experience running tech and business events, for IBM and as CMO for the Stamford Innovation Center. A music festival is a wee bit different. He booked national talent like Victoria Vox, and organized a great lineup including the CUkes from Westport, Abe Deshotel (Norwalk) and the Educated Fleas (Bethel). The Ukulele Festival also features food trucks and local music vendors. Instruments will also be available to borrow. Peter has had plenty of help, including Factory Underground (handling the live sound). Steve Forlano will be MC and workshop leader. So who will come? With ukulele’s growing popularity, Peter expects people ages 10 to 70, from all over New York and New England. Tiny Tim died in 1996. But I’m sure he’ll be there in spirit too.